A deep, elongated kettle hole, Long Pond has been the town’s source of drinking water since the late 1800s. Pipes were laid for a private water company that was formed in 1898, and a few years later the town purchased the system. Long Pond is the only pond on the Cape that provides town drinking water. It was once a popular spot for fishermen. Access to the pond is now restricted all year long, but in the 1930s, the state opened Long Pond for a week of fishing each June. It was a catch and release program; the small-mouthed bass and red and white perch caught by anglers were released into other ponds. In 1937, anglers reportedly caught 4,000 fish in that one week! 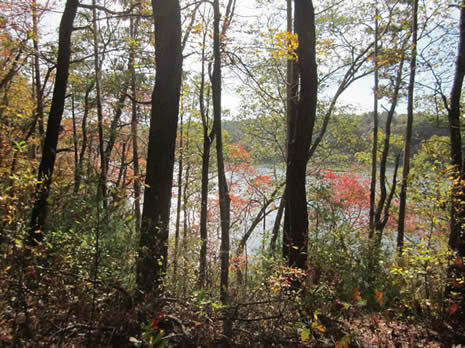 Today Long Pond is protected by 585 acres of forest and swampland. Although Long Pond itself is off-limits to the public, nearby Grews Pond is open for swimming, fishing and kayaking or canoeing. The town maintains a beach at Grews Pond, with free parking available. Access is from Gifford Street. The 3.5-mile dirt service road that circles Long Pond is open to the public. 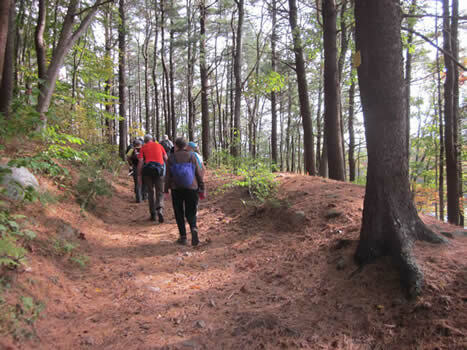 Because the kettle hole was formed at the edge of the glacial moraine, the terrain is smooth with gentle slopes on the southern side while the northern side has steeper, rocky slopes – more of a challenge for the walkers, runners and mountain-bike riders who frequent the area. The service road along the western side of the pond is the southern section of the Moraine Trail. At the northern end of the pond, this trail connects to the Cathedral Pines area, south of Brick Kiln Road, and to the Collins Woodlot trail network between Brick Kiln and Blacksmith Shop Roads. At various other points along the dirt road, several other trails allow access to Brick Kiln Road and Gifford Street. In 2015, the Town of Falmouth embarked on a two-year, $40+-million project to build a new state-of-the-art water filtration plant on the northeast side of Long Pond, a long overdue project to ensure that our drinking water remains clean and safe. The ring road near the site was temporarily disrupted, but it was re-routed and re-opened so that public access around the entire pond could continue. Parking is available at Grews Pond and at the entrance to Goodwill Park on Gifford Street. To access from the north, park in the dirt turnout on the south side of Brick Kiln Road, just east of the of the northbound exit off Route 28. The trailhead is about 75 yards back toward the highway, marked by a town conservation land sign.